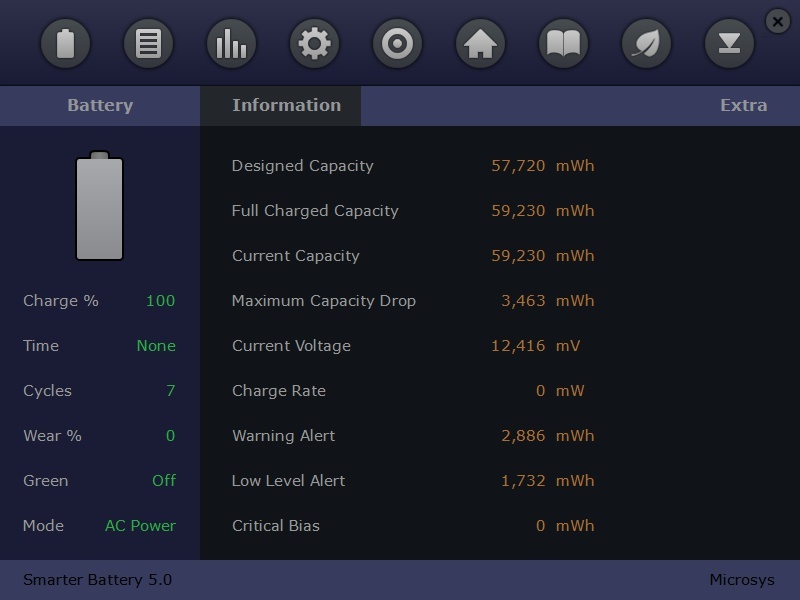 A battery monitoring utility for portable computers, intended to provide you with all the battery data, to help prolong its life and save its energy. It shows you the evolution of the battery's capacity during the charge / discharge cycles and computes a few important battery parameters, such as the Wear level and Discharge Cycles count. It features a new battery Calibration, Fast Discharge and Green mode functions. This program continuously reads the battery data, making a prediction for the time remaining. Two alarms, for low / critical battery capacity, can be triggered by either values of time remaining or capacity percentage you set. The battery capacity evolution can be graphically displayed for up to 16 hours period of time, so a complete charge or discharge cycle can easily be visualized and analyzed. Both calibration and fast discharge procedures were updated to perform better on Windows 10 laptops or tablets. A battery gadget, with many format options, is displayed by this utility and offers you a fast, clear view to the current battery state. The Power Plan selection is included in its menu, along with Shut down, Standby, Restart, Hibernate commands. A must have, inexpensive, easy to use utility that allows to maximize your battery life and performance! Windows 10 Manager - An all-in-one utility for windows 10 specially, it includes over forty utilities to optimize, tweak, clean up and fix Windows 10, helps make your system perform faster, eliminate system fault, increase stability and security, personalize your copy. System Mechanic Free - System Mechanic Free provides complete Windows maintenance and repair using advanced patented tools. It works to speed up Windows for maximum performance and stability by fixing registry problems, defragging hard drives, cleaning junk files and more. Nero TuneItUp Free - Nero TuneItUp is an optimization, tuning and maintenance tool for Windows PCs which helps you analyze and fix common problems, and optimize system settings. System Mechanic Professional - System Mechanic Pro keeps your PC fast, stable, and secure. It fixes errors and boosts performance, provides online backup, recovers deleted files, securely wipes data, and includes high-performance triple-certified antivirus protection. Windows 8 Manager - An all-in-one utility for windows 8 specially, it includes over thirty utilities to optimize, tweak, clean up and fix Windows 8, helps make your system perform faster, eliminate system fault, increase stability and security, personalize your copy. Super Cleaner - Super Cleaner (Antivirus & Boost) is a small, fast, and smart Android device cleaner and booster. With this app you can free up storage, boost RAM, remove unnecessary Apps, cool down CPU, boost games and get your mobile running like new again. Latency Optimizer - This application can help you to boost your connection speed, lower your latency, improve FPS and lower ping and lets your PC perform smoother! includes: system cleaner, free ram, connectivity fix, latency optimizer tool and an integrated speed test.